I wonder if regulars to the Nou Camp ever get bored of all that amazing football? Is there such a thing as too much of a good thing? I was wondering this while watching last night’s game between Phoenix Sports and Haringey Borough. There was plenty of action to keep me occupied, some terrific passing, crunching tackles, pull-apart fights, the lot. But in between all that, there was time to think about why I love non-league football. And I reckon it is because you can have too much of a good thing. Eat fillet steak every night and you soon grow tired of fillet steak. Variety is good. And you certainly get variety in non-league. You might see a defence-splitting pass. You might see someone kicked up in the air. You might see a clearance sliced out for a throw-in. You might see a thunderbolt break the net. You never know. The point being, there is real quality in non-league football, you just don’t know when you’re going to see it. I don’t mean that in a critical way. All of these players are capable of brilliance. You just might have to wait a little longer than you would at the top level of football. And from an entertainment perspective that is no bad thing. It is the theory of delayed gratification perhaps. You might have to wait a little longer than you like, but the wait will be worth it. I’m not being sordid. Or weird. Bear with me. The frustration in non-league is in the final ball. There will be an astonishing passage of play, every player knowing their role, every pass is crisp and sharp, every run is timed to perfection, and then that cross into the box is not what you were hoping and the unmarked striker is left wanting. Or fuming. You see it time and time again. But if that final ball always came off, would it mean as much? Haringey Borough’s first goal was wonderful in and of itself. A sweeping counter-attack. A beautiful cross-field ball from the right. A volley that combined power and placement. In off the bar. Absolute poetry. Football as art. Massively galling that the away team scored it, but the sort of goal that had both sets of supporters muttering “absolute worldie” for the next twenty minutes. Take a bow, Kwabena Asamoah. But it was so amazing, so breath-taking, because it is so rare that this kind of thing works out. Normally the counter-attack is countered. Or the cross fails to get past the first man, or just drifts out for a goal kick. Or the volley ends up in the next field, or by the corner flag. The wait made it so special. The unlikeliness made it so special. Much of the magic was in the scarcity of such an event. I’m not sure the game ever fully recovered. Haringey scored a scrappy second. The game turned niggly and nasty, the players, benches and supporters all getting angrier. A sending off for Phoenix, just a yellow for Haringey. Half-time was a relief, before it all got too much. Then a third for Haringey after the break, before I’d even made it out the bar, and the game was dead and buried. Phoenix have had a cracking start to the season and hopefully this is just a blip. They can clearly pass the ball around, and they have pace, skill and organisation in spades. But that goal, and Haringey’s sheer physicality, left them floundering. Phoenix needed a Plan B for when playing the beautiful game just isn’t possible. Haringey, meanwhile, could quite easily set up a rugby league club on the side considering their size and strength. And when they matched that with the skill involved in their first goal they looked irresistible. 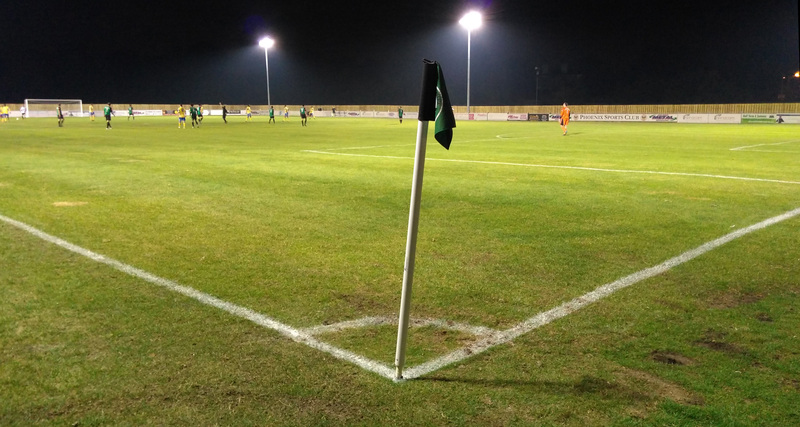 But maintaining that is the challenge, and indeed the appeal, of non-league football. Who knows what we’ll see from either team next week. That’s half the frustration, and half the fun.